Here is a 1929 Lady Patricia LF set in gold-filled, in the very rare Sheraton/pinstriped pattern. For those of you that enjoy flexible nibs, this one could be for you. It has a fine flex nib, is new-old-stock, and is mint in the original box. Along with the Sheraton finish, there were many others: the cable twist, Gothic, Basket Weave, BayLeaf, Smooth, in addition to Nacre, Persian, Onyx, Turquoise, Moss Agate, Jade, Grey Lace DeLuxe, and black hard rubber. From around 1930 – 1938, there were some truly stunning specimens produced in Grey Lace, Black, Silver Pearl and Sunset Red. Often, the Patricians would come in a pen and pencil set. 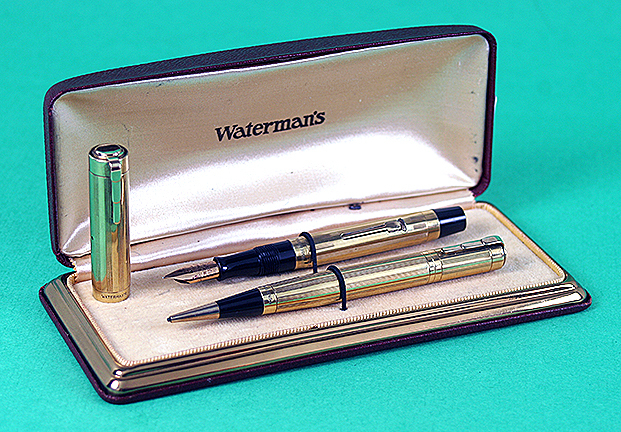 Circa 1929 – 1938, the pen sold for $10 with a matching pencil at $5. I wish they were still available at those prices!